13,057 foot Mount Dana is only 61 feet short of the highest peak in Yosemite National Park (Mount Lyell), and much easier to reach, being just over 2 miles southeast of the Tioga Pass entrance station, from where an unmaintained but well used trail climbs steadily to the summit, mostly over barren slopes of stones and scree. The view from the top spans 150 miles in some directions (see panorama), from California's Central Valley in the west to the Toiyabe Range in the east (in Nevada), and includes countless peaks, snowfields, valleys and lakes - most distinctive is Mono Lake, 5,500 feet below at the foot of the steep east face of the mountains. 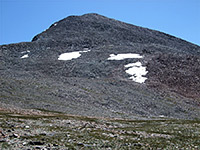 Dana is high enough to support a small glacier, at the upper end of a narrow ravine just to the north, surrounded by the reddish metamorphic rocks typical of this section of the Sierra Nevada crest. The hike to the summit gains 3,100 feet over 3 miles (20% average grade) but the route is relatively straightforward and a round trip can be done in 4 hours or so on a settled day in summer, though the thin air makes the walk quite challenging for those unaccustomed to hiking at these high elevations. Snow or adverse weather can increase the time significantly. 17 views along the trail to Mount Dana. Panorama from the summit of Mount Dana. The unsignposted trail to Mount Dana begins right next to the NPS toll booths at Tioga Pass, so vehicles can be left either in one of the two small parking areas a short distance west of the park entrance, or along wide verges on the east side. The first half of the path is as wide as many official Yosemite trails, but rather steeper, eschewing the usual switchbacks for a direct course up the hillside. The route starts off quite level, crossing partly wooded land at the upper end of Dana Meadows, past three shallow, reflective ponds and on towards the far side of the valley, where the ground begins to rise. The trail veers southwards, ascending diagonally up the slope then turns back east, at the start of the main climb. A few lodgepole pines persist a little way up, mixed with patches of wildflowers, growing quite thickly in a moist area around a streamway, before giving way to short grass and scattered Alpine plants. 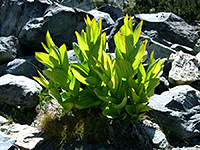 Some sections are a bit slippery owing to loose soil between boulders, but most of the remainder is firmer, until near the summit where the mountain is covered by larger rocks, jagged and somewhat unstable. The hillside above reveals more of itself in stages, as the path climbs over several minor ridges, accompanied by a decrease in the amount of vegetation, so that when reaching a flat bench 1,500 feet up, the grass has largely disappeared, to leave just bare stones and lichen. This flat area is about half way in both distance and elevation, so makes a good place to rest for a while. Already the views are very extensive, over Dana Meadows and the reddish peaks of the Tioga Crest to the north. Rock piles on the plateau provide homes for pikas and marmots; otherwise there is little wildlife to be seen on the upper part of the mountain. Ahead the stony hillside gradually rises towards a steeper talus slope leading to the summit, an obstacle that looks neither particularly high nor far, yet the scale is deceptive - there are no other features in view to help give a sense of perspective, just rocks and sky. The top of the far slope is still 1,500 feet higher, and the stones near the summit are actually boulders several feet wide. The path crosses the gently sloping land to the foot of the main slope then becomes less well defined, as the rocks underfoot are now large and unsteady; in places the trail splits into several parallel routes, but walking directly up in a straight line is often just as easy as trying to follow the path. Mount Dana's summit is quite small, just a few yards across, marked by the remains of a stone shelter, a USGS benchmark and a metal tin containing a notebook to record visitor comments. The nearest neighboring peak is Mount Gibbs to the south, 289 feet lower and 1.5 miles distant, so far enough not to block any of the view. 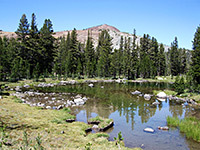 The panorama takes in the angular, permanently snow-capped peaks to the north (Tioga Crest), Mono Lake, Owens Valley and the Nevada mountains to the east, the grey granite peaks at the center of Yosemite to the south, and the rounded domes to the west, where the land is more forested, sloping down towards the smog-covered Central Valley. Other lakes in view are Helen, Spillway, Bingaman, Kuna, Dog, Gaylor, Granite, Tioga, Shell and Saddlebag.